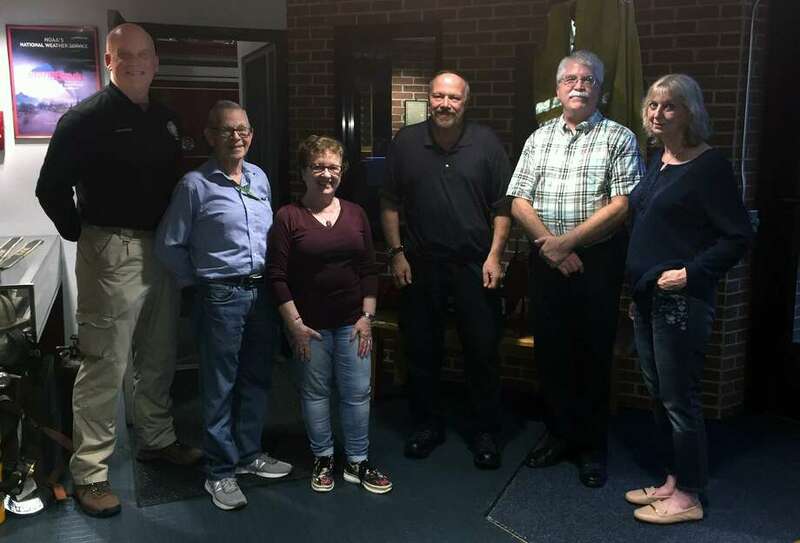 At an event that took place at the Westport Fire Department headquarters on Sept. 26, outgoing Community Emergency Response Team President Ernie Heidelberg, second on left, and his wife Zulema Heidelberg third on left, congratulate the newest members of Westport CERTs Executive Board: President Mike Vincelli, third on right; Vice President David Kinyon, second on right; and Treasurer Shari Brennan, first on right. Joining them was Bob Kenny, Region 1 coordinator for the Connecticut Division of Emergency Management and Homeland Security, first on left. Jacquelyn Rasieleski Dionne, of Westport, has been named to the University of Scranton’s board of trustees. A native of Scranton and a University of Scranton alumna, Dionne became a registered nurse upon graduating from Community Medical Center in 1986. She received a bachelor’s degree in health administration from the University in 1989. She began her career as a trauma intensive care nurse in Scranton and continued as a cardiothoracic nurse in Boston and the New Hampshire Heart Institute. She recently returned to a medical setting, working as an registered nurse with elderly and Alzheimer’s patients. She is active in numerous charitable organizations, including having served as a vice president for the National Charity League, Westport Chapter, as well as Horizons Organization of Bridgeport Connecticut, Meals on Wheels and several other nonprofit organizations. Dionne previously served on the University’s board from 2011 through 2017. During that time, she chaired the advancement committee, served on the executive committee, and on both the presidential and provost search committees. In 2015, she was instrumental in the creation of the Kania School of Management’s Business Wall of Fame. In 2013, she and her husband, John D. Dionne, were co-recipients of the University’s President’s Medal, an honor presented by the President’s Business Council. In 2008, the University named its newly created green at the heart of its campus in honor of her and her husband. The Westport Chapter of Hadassah’s Fall Fundraiser will take place on Oct. 20 at Temple Israel. The Flying Ivories, one of the premier dueling piano entertainers in the Northeast, will perform at the event. They play everything from Billy Joel to Aretha Franklin, from Sinatra to Metallica, from Garth Brooks to Madonna. Additionally, there will be an open bar, kosher dinner, wine tasting, silent auction, and other great surprises. Two of the Chapter’s past presidents and active board members, Ivy Gosseen and Alison Sherman, will be honored at the fundraiser. Both of the honorees are lifetime members of Hadassah who have held multiple roles in our Chapter. Honorary certificates will be presented to the honorees at the event. In connection with the event, we will be creating gift baskets for the four Israeli emissaries through the Federation Israeli Emissary Program serving our community this year. We invite you to donate items to be included in the baskets. Possible items are winter gloves, movie tickets, candy, gift cards to local businesses/restaurants. Bring donations to the event if interested in donating. The proceeds will benefit Hadassah Medical Organization and its lifesaving work, including areas of nephrology and organ transplantation. For information, contact Marcia Falk at mkfalk@gmail.com or Deborah Greenberg at debgreenberg4@gmail.com. The following Westport residents recently matriculated as first-year students at Hamilton College: Brooke Kessler, Ian Bernstein and Peri Kessler. Westport residents Nicole Dienst, Anna Ehli and Sally McGee recently enrolled as part of the Colgate University Class of 2022. Wesport residents Catherine T. duBoulay, Alexandra N. Holoubek-Sebok and William N. Marshall enrolled at Colby College in Maine. Nicholas Diaz, Elizabeth Mathis and Tyler Wright enrolled for the fall semester at Eastern Connecticut State University.